Creating a new look from an old piece of furniture can be an afternoon project that will give you a focal piece for just about any room. It’s an easy task that can give your room a sense of style for very little money. Go to pinterest.com/mattershome and follow our Matters of the Home board of painted furniture for a whole selection of dressers for some easy inspiration. 1. When you take the drawers out of the dresser, number them on the inside with a piece of tape. Drawers fit better when they go back into their same old space. 2. When you remove the handles and screws, place them in a big plastic bag so you won’t lose any of them. 3. Lightly sand, but don’t overdo it. Wipe down the dresser after sanding to remove any particles. 4. Prime before painting. Priming now comes in spray cans and is very easy to use. Let dry. 5. Paint from the top down in very light coats. Spray paint is fine here too. 6. If you are painting your dresser black, use black spray primer too. 7. If you want to be neat, tape inside the dresser and on the sides of the drawers to keep paint from getting on the inside surface. There are more tips and plenty of ideas on the internet, including decoupaging with maps, scrapbook paper, gift wrap and wallpaper. There is no end to how much you can do for a new look. 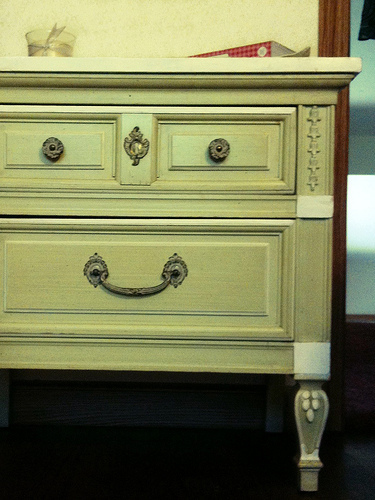 A dresser can also serve as a foyer chest, a bedside table, a buffet in a dining area, and much more. Let your imagination be your guide, and have fun.